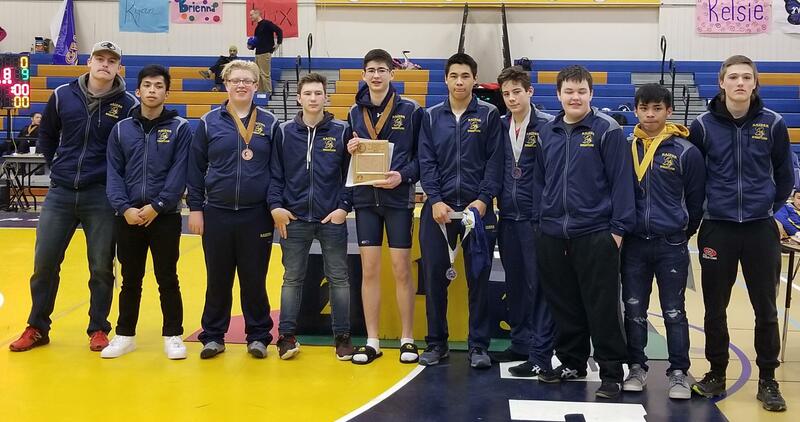 The UCSD Raiders Wrestling team is heading to the State Championships in Anchorage after placing second in the Great Alaska Conference Tournament in Bethel last weekend. The team scored five first place wins, three second place wins, two third place wins and one fourth place win in the regional competition, and Coach Brian Whittern is very proud of what they have accomplished this year. “This is the best season that the wrestlers have had, ever,” Whittern said. Before the State competition this weekend, the qualifying wrestlers were placed in a bracket based on their past records and for the first time ever, multiple wrestlers were ranked and seeded. Blaine Henning is seeded number one for the State tournament, Seth Henning is seeded in the number two spot, Alex Esnardo is currently seeded third, Dustin Ruckman is seeded fourth, and John Esnardo sixth. Additionally, Halle Savage is seeded fifth for the Girls Division. Congratulations to the Raider Wrestling team for what Coach Whittern described as “a very, very good season,” and stay posted for the resulted from the 2018 ASAA/First National Bank Alaska Wrestling State Championships, which will be held on December 14th and 15th at the Alaska Airlines Center in Anchorage.